Topical vitamin C, also referred to as L-ascorbic acid, is a topical antioxidant that has been shown to increase collagen production, smooth the appearance of fine lines and wrinkles and even skin discoloration, according to Skin & Aging magazine. 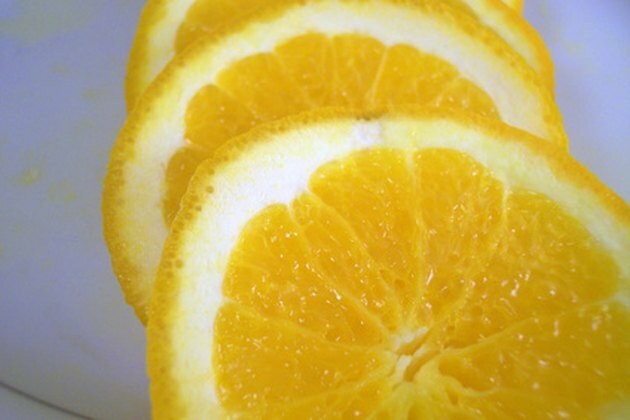 The most important thing to look for when choosing skin serums containing vitamin C is the concentration. The serum must contain at least a 10 to 15 percent concentration of vitamin C to be deemed effective, according to Skin Care Guide. Vitamin C is an unstable compound, and when exposed to air it becomes ineffective and potentially harmful, because it may increase the production of free radicals, according to Smart Skincare. Skin care companies have introduced stabilized forms of vitamin C, but these serums can be costly. Companies may also advertise that a serum contains vitamin C, but it's important to make sure the concentration is at least 10 percent. Vitamin C skin serums, because of the high concentration necessary to be effective, are most often sold at department and specialty stores. There are some vitamin C serums available at drugstores, as well as natural and organic formulas that are sold at specialty health stores. Stabilized vitamin C serums with at least 10 percent concentration typically range from $15 for a drugstore serum, to $50 and upwards of $200 for high-end department and specialty store serums. As a rule of thumb, the higher the concentration of vitamin C and stabilization typically increase the price of a vitamin C serum.